The 2001 Buell S3t Thunderbolt motorcycle for sale in Ohio has only 16,700 miles on the odometer. It is painted a dark charcoal color. The motorcycle has a 1200 Sportster engine, a set of Vance and Hines slip on exhaust pipes that sound awesome, a set of fairing bags, a newer back motorcycle tire. The Buell Thunderbolt runs real well and should give the new buyer many miles of riding pleasure. It does have some cosmetic damage but nothing major. 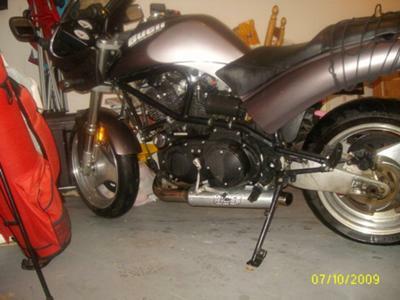 This 2001 Buell S3t Thunderbolt motorcycle for sale is a touring model but I do not have the bags or brackets. GoGoCycles would also encourage bikers to submit a review of the Buell Thunderbolt to help potential buyers make informed decisions and to benefit the biker community as a whole. I'm asking $3,500 or for your best offer. If interested in buying the motorcycle email me a message with your information in the space below provided by GoGoCycles Used Motorcycles for Sale and I will get in touch.